G13 – Provide cues for interaction for initial learning and sub-sequent use of the technology. Provide cues for interaction for initial learning and sub-sequent use of the technology. In spite of intuitiveness in the use of multi-touch surfaces, it’s necessary provide some cues to facilitating a initial learning as well as sub-sequent use of the technology by older users, for example through written messages. This application uses a written message to help user. 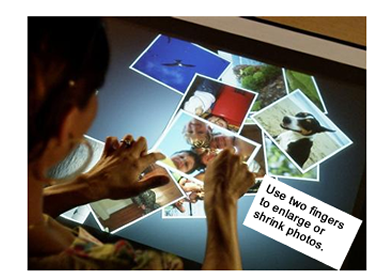 Accessibility, Affordance, Elderly, Interaction, Intuitive, Learnability, Multi-touch. G1 – Tap gestures (when applied to well recognized objects) are the easiest ones to understand and remember. Tap gestures (when applied to well recognized objects) are the easiest ones to understand and remember. 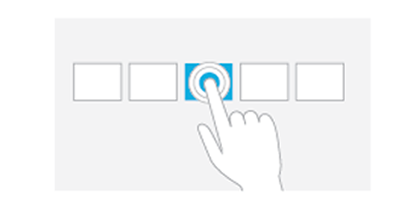 The tap gesture is considered a simple gesture for performing in the multi-touch interaction. This gesture is easy to understanding and remembering in the future interactions. An example of tap gesture use in a multi-touch interface. Easiness, Elderly, Gestures, Interaction, Intuitive, Learnability, Remembering, Understanding , Multi-touch.